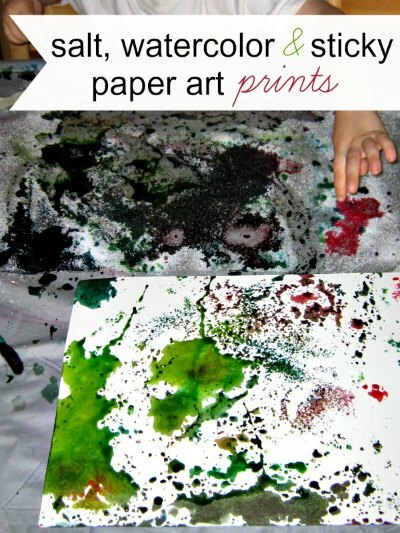 I’m constantly on the lookout for fun art project ideas I can do with the kids. I’m not as creative as some moms out there so I need to keep my eyes open for clever ideas. I wanted something to do with our liquid watercolors, which are one of my favorite art materials for the kids. We taped some sticky paper (aka Contact Paper), sticky side up, onto a work surface. (My husband once bought this ugly grey shower curtain which I cut up for painting mats.) New Kid and I sprinkled the sticky surface with salt and using liquid watercolors he painted across the salt. You could use a solid watercolor palette like the original post, but I prefer the flexibility of liquid color because you can also add color with an eye dropper. Needless to say, New Kid loved this and made gorgeous pools of color, which were sucked up by the salt. In the end, the sticky paper with its mountains of saturated salt wasn’t worth saving but instead, we created a print by pressing a piece of watercolor paper down on the surface of the colored salt. The print came out quite lovely! MORE: We also love using salt on watercolor art work to create a gorgeous effect! Follow my most popular board on Pinterest! Follow Erica • What Do We Do All Day?’s board Art + Craft Activities on Pinterest. How do you make the print? Is it just putting the paper on top of the salt picture and pressing down while it is wet?